Vitaflex & Raindrop Training in London a great Success! 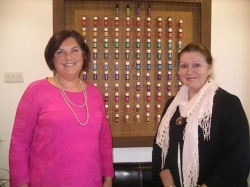 London Vitaflex & Raindrop Training Course a Great Success! 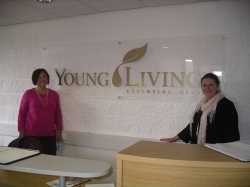 Suzanne LeQuesne and I are absolutely thrilled at the success of our 2 day London Vitaflex & Raindrop Techniques Training Course, integrating the powerful plant energies of Young Living Therapeutic Grade Essential Oils . As a partner in Raindrop Training Europe, Suzanne flew in from Spain and we were delighted to have students from Italy and the UK. So successful has our training proved to be, thatwe are now taking bookings for January 2014. Also we will also be assessing and awarding our professional students with a certificate and adding them to our Raindrop Training Europe Practitioners Register, for public enquiries. You can find details on how to book a place on our next training on 25th and 26th January athttp://www.sheilacrouch.com/next-raindrop--vitaflex-training-london--25th-to-26th-january-2014.html. Places are already beginning to fill up fast so please make sure you secure your place with a deposit. "I just wanted to say a huge THANK YOU for a lovely two days training last week. I have all my oils now and I am gradually learning all their wonderful benefits . I have to say I felt amazing after my treatment and this has continued, I feel very strong suddenly. One of my ladies that suffers from MS came the following morning and although I did not have all the oils, just the peppermint and lavender, I decided to use the technique on her ( I explained I had just learnt and awaiting assessment but she gave me permission) . Her opening words to me as she walked through the door were "I need your magic , I feel like a bag of weasels ! " We have also had reports of backpain, hip pain and sciatica disappearing in treatments by students as well as blissful relaxation and energising effects. We also have enquiries fromFinland, Sweden, Tenerife and Holland, which we are following up, so if you want us to put on a training near you or want more information about future courses, please contact us. 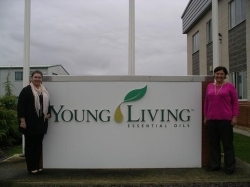 Suzanne and I had a wonderful day visiting Young Living Headquarters in Kimbolton, where after a very wet drive up the A1M we had a wonderful welcome from the team. It was really great to meet Tara and Mandy who guided us around the building and took these photos for us. We also were very interested to see the warehouse where all the oils are distributed over Europe and the offices where all the planning of events and administration of the fast growing market for these very special oils take place. 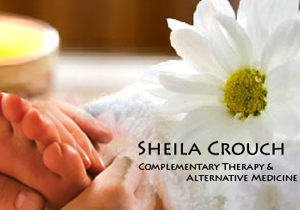 The wonderful ethos behind this company of making natural healing and non-toxic options available to all, is evident in the provision of airy and comfortable offices and excellent staff facilities. The atmosphere is aromatic, happy and friendly and great pride was taken in showing us around. A special thanks also goes to Tom who was not in the office but left us a box of goodies whilst arranging events around Europe. We also met the multi-lingual team who man the phones and take orders. If you are interested in learning about using Young Living Oils which offer not only therapeutic properties but also can be used as natural alternatives to over the counter drugs and for personal and domestic, non toxic, hygiene, please contact me. Talks and Pamper Parties demonstrating how you can have a healthier lifestyle available as well as Raindrop sessions. Further information can be found on this website under Raindrop Technique.